Another really busy week has flown by, and the Pacific is beginning to feel closer than ever. One of the big moves forward this week is that we are now also accepting Bitcoin as sponsorship/donation towards the row (see Steve’s blog post from last week). We had our first donation within a few hours of opening up to Bitcoin, which is really encouraging – a big thank you to the generous mystery donor! Thanks also for all the other Bitcoin donations that have been coming in over the past couple of days. It’s really good to see this move forward being embraced. On Saturday Steve and I exhibited and spoke at the London Bitcoin Expo, which was quite an experience. We spent all day talking to people, and gave presentations on each of the two stages as well. It was a long and exhausting day, but really interesting talking to so many different people, and has hopefully made more people in the Bitcoin community aware of the challenge. We are also really grateful to Alex for fitting us in so late in the day. On Sunday I took my RYA First Aid course, which is one more ticked off the list and that bit closer to being qualified to do the row. Discussion of hypothermia, concussion and seasickness was mixed with learning how to perform CPR and the right way to bandage up different injuries. On course, a lot of what is covered in the everyday First Aid course isn’t quite relevant to the solo ocean rower! I won’t have anyone with me who can be saved by CPR, and I won’t be able just to phone the hospital if I have an injury! It was good to remind myself of the basics, but I think I’m going to look into doing a more directly relevant course as well, such as first aid in a remote environment, or for the solo adventurer. 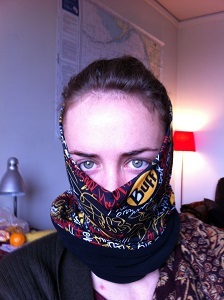 In sponsorship news, I have joined Team Buff UK, and have just received a brilliant selection of products from Buff. I used a Buff throughout my jungle expedition in Borneo, and know how multifunctional they are. I’m looking forward to testing these ones out on training trips over the coming months! Previous PostJBP PR and Parliamentary Affairs: JBP backing solo row bidNext PostWeek -26: SIX months to go!